The term SEMOLINA or SEMIYA [ in Tamil Language] is derived from the Italian word ‘semola’ meaning ‘flour’. It is obtained by milling wheat – in the process when the bran and the germ are removed and the starch is broken into coarse pieces. Semiya made from Durum wheat is usually yellow in color where as it is white when derived from softer varieties of wheat. It is used to make a variety of dishes including puddings the world over and can also be used as coating for dishes to give a crispy flavor. The beauty of this ingredient is its adaptability. Any kind of dish can be made from this – sweet or savory dish with any spice, in liquid, semi solid or solid form. In India Semolina is used to make a variety of dishes – both sweet & savory like Halwas, Payasams, Puddings, Upma, Falooda and Bath varieties. In a heavy bottomed pan put 1tlbs of ghee and fry Semiya till light brown. Add enough water to cook the Semiya. Take care not to over cook. When soft add thick milk and let it boil on low flame till it reduces to half the quantity. Add sugar and stir till it dissolves. Add Cardamom powder and remove from gas. Heat rest of the ghee and fry cashew and kissmiss till golden brown. Add to the Payasam. A strand of saffron soaked in warm milk for ½ an hour can also be added for flavor. For a different flavor and when in season you can add mango pulp to this mix while adding sugar to get a nice mango Semiya payasam. But please ensure that the heat is switched off the moment the mango pulp is added to avoid curdling. 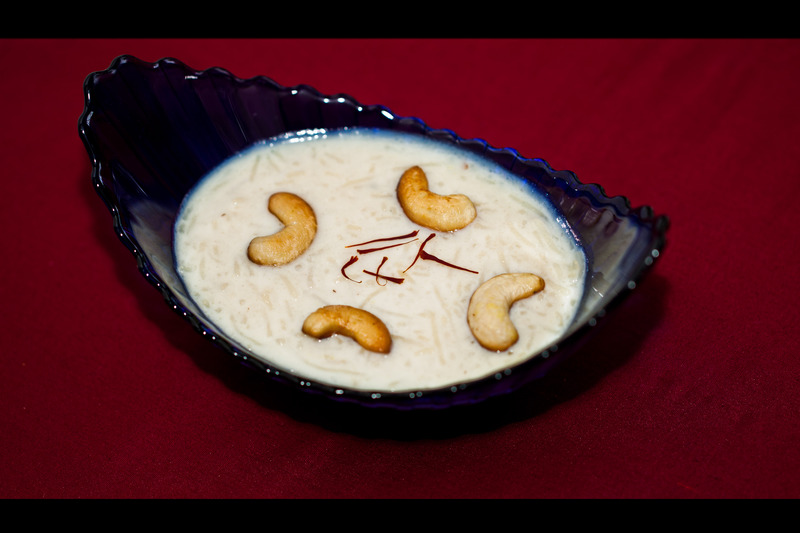 This entry was posted in Recipes and tagged dessert, India, Indian, Indian Dessert, Payasam, Photostrophe, Photosundari, Raghu, Raghu Lakshminaarayanan, Semiya, Semola, Semolina, South Indian Sweet, Sweet, Vermicilli by photosundari. Bookmark the permalink.